I grew up in the San Francisco Bay Area in the 1970s. As far back as I can remember, I always loved movies, of which there was never a shortage back then, even though there was just a wee handful of channels. True, there are still movies on television today, but it’s different. Back in that time, much of entertainment programming was devoted to old movies; the studios rented their catalogs for pennies, and a great number of films were public domain, meaning no one owned the title and it cost the station nothing to broadcast it. To simply run a movie, or even a string of movies, however, often wasn’t enough. In the old days (because I realize I’m starting to sound like one of those old guys who sits forlornly on a park bench, pulling a bag of bread crumbs from my Members Only jacket and feeding the pigeons that aren’t even there anymore, but in the old days there were lots of pigeons, and those pigeons were badasses, I tell you what), we had regional television, meaning that we had the Big Three (DuMont was gone by that point), and then a bunch of local stations and, come to think of it, the Big Three were really only the Big Three during prime time. The rest of the time, they were just local stations. And with those local stations came the local personalities. I am totally not making this up. 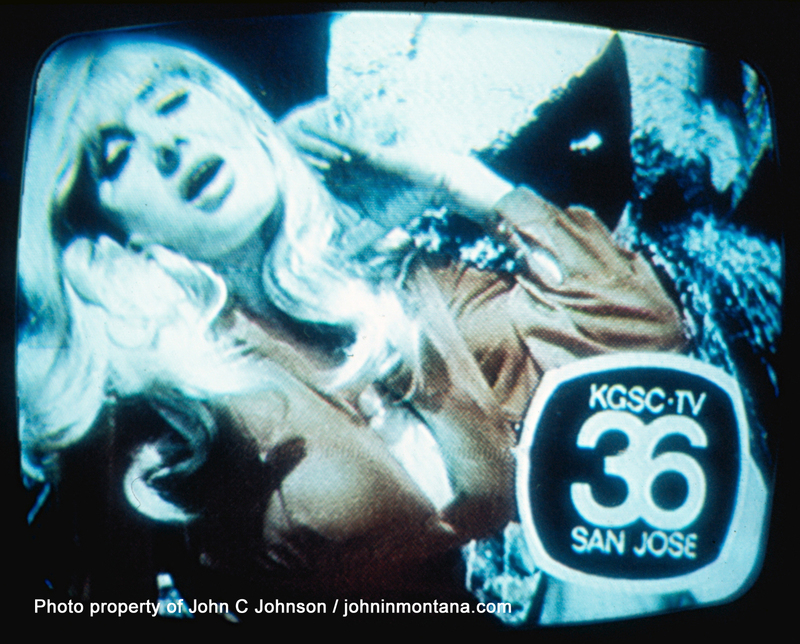 Arguably the more bizarre station of the era was Channel 36 (originally KGSC, Stockton, now KICU, San Jose), whose on-air spokesperson was Carol Doda, the spectacularly knockered stripper whose home was the famous Condor Club in San Francisco’s infamous North Beach district. Dressed provocatively, her breathless declaration that we were watching “The Perfect 36” without a trace of irony remains a punchline well-remembered by all who lived in the Valley at the time, albeit usually in the form of “That really happened, right?” -type conversations, within the framework of the type of fuzzy nostalgia usually brought on by beers with old friends. That’s Santa Clara Valley, by the way, not Silicon Valley. That mess came later. Just in case there was anyone left who wasn’t offended by the stripper, the bullfights, and the Mexican wrestling. Steadfastly politically incorrect, Channel 36 featured bullfights from Mexico City on Saturdays, usually followed by the unbridled awesomeness of Mexican wrestling. 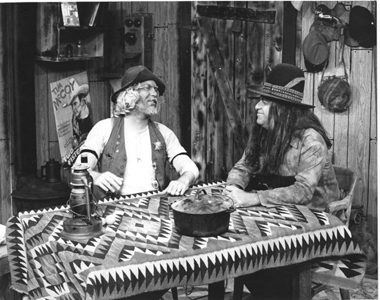 And if all that weren’t enough, there was Gary Ferry, a mainstay of local television, whose niche was hosting movies, first on The Old Sourdough and Wachikanoka where, dressed in Indian attire, he would host old westerns with Andy Moore and enjoyed a degree of cult celebrity. A later show, called Race Street and Bascom Avenue featured Gary playing Race, and Andy playing Bascom, which was and, to the best of my knowledge, still is, an actual intersection in San Jose. So the gag works on two levels. The format for these hosted movie shows was that of similar shows across the country: a little banter to open the show, a few segments during the movie, and then a wrap-up at the end. Later, Gary would host Movies All Night, this time as himself, the spokesman for MMM Carpet in San Jose. A personal high-water mark for this writer would be getting permission from Mom and Dad to actually stay up all night for a Marx Brothers marathon at the tender age of ten, and a feat I came very close to pulling off, having fallen asleep around dawn during the final movie, the lamentable The Big Store. Sadly, we lost Gary back in 2009, although I did have the good fortune to have met him in the mid 1980s, and thanked him for his years of entertaining service. You have no idea how close to tears this photo brings me. As much fun as Channel 36 was, we had another channel, KTVU Channel 2 from Oakland, which had the twin powers of broadcasting giants Pat McCormick and Bob Wilkins. McCormick was the host of the local Dialing For Dollars show, which ran on weekday mornings, first with a movie and later with a two-hour block of sitcom repeats. 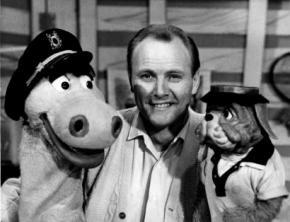 Pat was a local television mainstay, and his greatest contribution, by his own admission, was in a series of short videos starring his puppets Charley and Humphrey, with quick lessons on such varied subjects as kittens, hostility, and boating safety. Pat also hosted the local (Oakland / San Francisco) portions of the Jerry Lewis Muscular Dystrophy Labor Day Telethon, while Channel 36 handled the San Jose segments which were predictably surreal, known to feature appearances by octogenarian tap dancers and Elvis fan clubs. These were interesting times. At the top of the regional television pantheon, however, stood a broadcasting legend, the host of KTVU’s Creature Features, Bob Wilkins. Bob, unlike virtually every other horror movie host, did not dress in costume, wore no strange makeup, and for the most part played it straight. 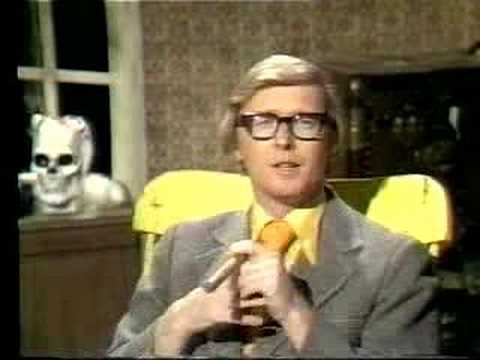 With his yellow rocking chair and ever-present cigar, Bob’s non-terrifying appearance and gentle ribbing of the often terrible films he presented endeared him to every horror nerd, young and old, who watched the show. And we watched religiously, because Creature Features was also our primary source for nerd info in a pre-internets world. When Dad was working the night shift, Mom and I would stay up and wait for him, watching Creature Features to pass the time; this was when I learned that being scared can sometimes be a lot of fun. The first time I saw Night of the Living Dead, the movie that had actually freaked out my un-freakoutable father, was on Creature Features. The first time I saw clips of a new movie called Star Wars, was on Creature Features. No form of media had a greater impact on my love of horror and science fiction movies than Creature Features. So okay, nice trip down Memory Lane, but what does it mean? I don’t know, maybe nothing. Then again, maybe something. What we have now is nice, be it satellite or cable, but what we’re missing is a sense of community identity, an interconnectedness that was part and parcel of growing up in a time and a place that was different than others. Not better – not by a far shot – just different. A feeling that there were other movie nerds up late watching along with you, separated physically but connected through the shared experience. Moreover, the people we watched on TV weren’t necessarily professionals; the shows were extremely low-budget, the camera work was questionable, and the jokes as stale as Bob Wilkins’ cigar smoke as Saturday night became Sunday morning. These endearing qualities connected us with the hosts, like we were sitting in our weird uncle’s converted garage/rumpus room. I realize now, years later, that the late-night and all-night movie shows weren’t live, that they were recorded during the day and broadcast later, but that really doesn’t diminish the effect. None of us were in possession of VCRs yet, so even though the shows weren’t broadcast live, the audience was watching live. When I left the Bay Area, nearly twenty years ago, KTVU was showing Will & Grace reruns in the old Creature Features time slot. Channel 36 has since merged with KTVU and both run paid programming commercials all night. Bob Wilkins and Gary Ferry both passed away in 2009, and Pat McCormick has retired, and those of us who grew up then, who came of age then, we have lost a bit of that small-town feeling we once had when life was simpler. 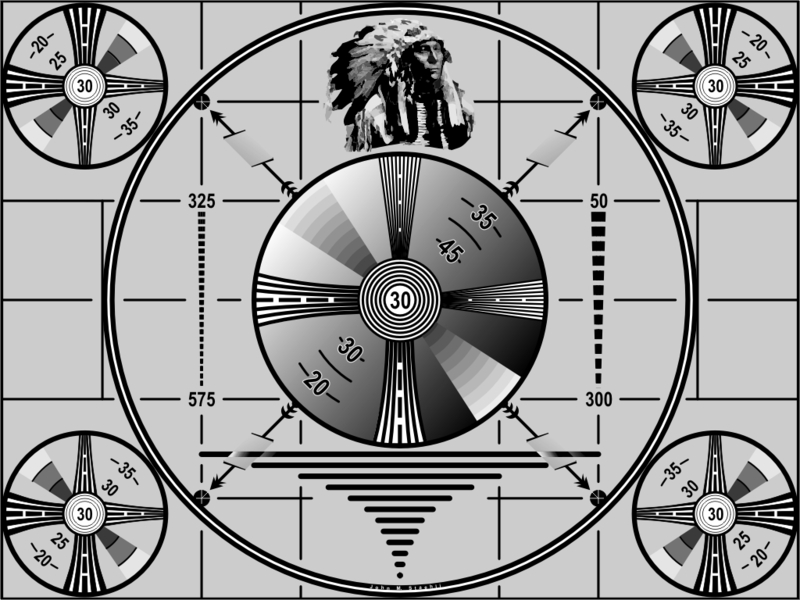 And that, I guess, concludes our broadcast day.